Three weeks ago the beard-cutting hate crimes convictions were overturned by a federal appeals court in Ohio. Following part 1 of his look at the case, today Donald Kraybill shares some analysis of the case reversals, including why they happened, why they matter for future cases and what might happen next. Maybe not surprisingly for a legal argument, it turns out the reversal hinged on the interpretation of just two words. We also have our three Renegade Amish winners at the end of the post. On August 27, 2014, the United States Court of Appeals for the Sixth Circuit in Cincinnati the appellate court overturned the hate crime convictions in a 2-1 sharply divided decision. The court upended the hate crime convictions for what it considered an error in the district court’s instructions to the jury. The legal decisions ensuing from this reversal will establish a judicial standard for how Shepard-Byrd is interpreted in the future for all hate crimes sparked by a victim’s gender, sexual orientation, disability, race, ethnicity, or religion. This new development upscales the significance of the Bergholz case because of its potential impact for prosecuting all hate crimes. The US Department of Justice may consider several possible options: 1) proceed with new trials for some of the defendants, 2) appeal to the full bench of judges in the US Court of Appeals for the Sixth Circuit (en banc), 3) petition the US Supreme Court, or 4) resentence those defendants charged with lying to the FBI and concealing evidence. Depending on the response of the Department of Justice, local municipalities in Ohio might proceed with their own prosecutions. Sam Mullet and the other defendants remaining in prison are still under indictment. They remain convicted of concealing evidence and perjury. They will likely petition district court Judge Polster to be released from prison while the legal process continues. About a half dozen defendants with one-year prison sentences have already returned to Bergholz. Please do *not* enter my name for the giveaway, as I went out, bought the book, and am absolutely tearing through it. Oh, what a heartbreaking story! I’m so glad that Don Kraybill wrote this book; he’s able to capture the pain of broken family ties, broken church ties, broken unity that cause as much shock and pain as the sensational beard-cutting incidents that got all the press. Congratulations winners! Email me your shipping address (to ewesner@gmail.com) and I’ll pass that to Johns Hopkins so they can get you your books. If you didn’t win, you can get Renegade Amish in both dead-tree and electronic versions at outlets including Amazon, Barnes & Noble, and Johns Hopkins. UPDATE: I meant to include some information on Donald Kraybill’s speaking dates and book signings. Here is the upcoming schedule, with events in various locations in Ohio and Pennsylvania. Perry Reese Community Center at Hiland High School in Berlin, Ohio. German Village Center in Berlin, Ohio. Very interesting. And important. Thank you. As others have said, this is a fantastic update to the previous post, and congratulations to the winners of the book. I admire Donald Kraybill for actually reading through and answering pretty much every question that was posed by Amish America readers in the previous thread. Other contributing authors do so too, but I was struck by how many Donald replied. I like that about reading Amish America, when Erik has a guest, that guest takes responsibility to follow up on the comments made. Please don’t consider that last paragraph condescending on any level; I do not intend it to be that way. writings reviewed on Amish America. 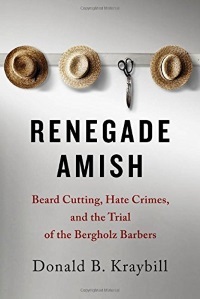 I am going to buy and read a copy of Renegade Amish, and already have a couple of Amish friends who want to read my copy when I’m through. I was interested to read in the listing of events planned about the book, that at least a couple have been arranged by Amish people. Shom I love seeing both things too – authors responding and some of our less-often commenters chiming in. Thanks to both Don and all you great readers. Hi there Slightly-Handled-Order-Man! This is Donald Kraybill and I’m just checking in to say THANK YOU for saying thank you to me. It certainly does make the content and conversation more exciting when the author responds. Also CONGRATULATIONS to the three winning entries. I hope you enjoy the book. Who would have thought, when coming upon/following this blog, that it would include something of a precedent regarding (of all things) HATE CRIMES! SO interesting and “current”, besides! I’ll be having surgery later this week with a long recovery, and I’ll have a LOT of time to read. I hope to read Renegade Amish! Thank you for your contribution in recording Amish life & history “as it happens”, Mr. Kraybill! Good luck with your future endeavors! will be with you Alice Mary as your date for surgery approaches. I have been out of pocket and not checking AA much lately. So I guess I didn’t even realize that you were facing this, OR, senility is setting in and I knew, but have forgotten. Regardless, I hope that this is nothing super serious. At any rate, please keep us posted on the surgery and the recovery. Good luck on both & on tour reading list, too! make that “your” reading list. Congratulations to the winners! You are lucky ducks! And congratulations to Don on the completion of your book! For those close to Ohio or Pennsylvania, Donald Kraybill is having book signings of RENEGADE AMISH. To coincide with the National Book Release, he is scheduled to speak on Bergholz Friday, September 19 at the Perry Reese Community Center at Hiland High School at 7 p.m. in Berlin, Ohio. Don is scheduled to have a Book Signing on Saturday, Sept. 20, 9 a.m.- noon, at Gospel Book Store, Berlin, Ohio, at the same time as author Wanda Brunstetter. Book signing Sept. 27 in Lancaster, PA.
Linda, thanks for the reminder here. I’ve updated the post above with 8 speaking and book signing dates for September and October, in various locations in Ohio and Pennsylvania. Thanks for the analysis, it certainly clears things up as to why they decided it was not a hate crime (right or wrong) I couldnt understand why they would decide that based on the brief articles I saw. And congrats to the book winners!